The Claddagh ring (Irish: fáinne Chladaigh) is a traditional Irish ring given as a token of love or worn as a wedding ring. The design and customs associated with it originated in the Irish fishing village of Claddagh, located just outside the city of Galway. The ring was first produced in the 17th century during the reign of Queen Mary II, though elements of the design date to the late Roman period. Since March is the month to celebrate an Irish heritage I'm highlighting this ring for Second Chance Tuesday. It is available in my Bella Rosa Shop at a discounted price. With sterling silver going way way up this is a great deal... besides the fact the ring is so charming! Lovely ring. Thanks for hosting Second Chance Tuesdays! And to think - we are headed to Ireland! wonder what other Irish customs we will learn of. 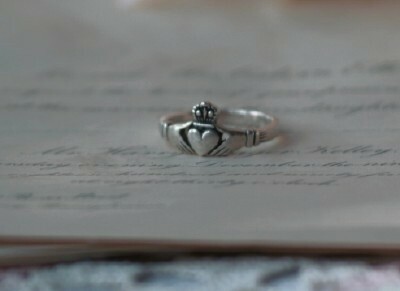 What a sweet way to celebrate St.Patty's Day with a delicate Claddagh ring. Hope you have a great SCT today!